Never ever let someone stop you. We’re in the La Boca district, about to get a taste of a soccer game between the CA Boca Juniors and Olympia, or rather, its infamous fans. This barrio of Buenos Aires has a lot of really interesting history and cultural activities, which you can probably read about on other websites. The streets are really colorful, inviting and lively, which poses as a mask for what happens behind the curtains. It can be dangerous out here. Moreso because we arrive at an interesting time: right before the first match of the season. Unable to obtain any tickets, we opt for a viewing of the game in a pub next to the stadium. Getting to this pub in the first place turns out to be tricky. Some streets are guarded by impressive police men, whom must be carrying a wide range of Call of Duty-like weapons. Marcos explains that they actually never wear any arms, for that would only let matters escalate. We ask the policemen which streets we can enter. They advise us to not go into these streets and those alleys. Since we’re so obviously tourists, a blind man would see us coming (I think the blond hair is a rather huge tell). Nevertheless, after zig-zagging through a bunch of streets, while being watched by curious eyes and dodging a couple of bullets here and there, we make it to the pub. Phew. Everything is nice and quiet here. Time for a beer. Slowly but surely more people join this peaceful gathering of soccer fanatics. The bartender appears to be a kind fellow, serving some pizzas overloaded with cheese, cracking a few Argentinian jokes here and there. Two brand new 1980's color TVs hang on the wall, broadcasting previous Boca games to these fine men truly enjoying the game of soccer. Birds tjirlp outside, the sun shines, life’s good. But then the game starts. Suddenly the doors of the pub are closed. There’s no way in or out of here anymore. People start shouting and smashing both hands on the table. There’s beer flying through the air. Everyone starts either hanging on to each other, cheering, yelling, jumping up and down, screaming or all of that at the same time. I’m not sure what to do, how to behave or what to sing. 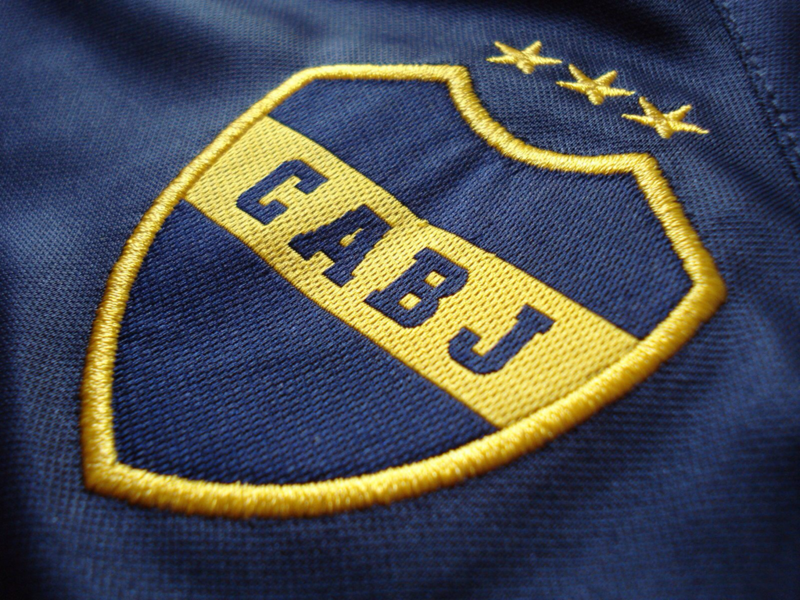 Everybody wears a Boca jersey. A guy with a funny face comes standing next to me, shouts some Spanish gibberish in my ear while pointing at my shirt. I quickly look at my shirt. It’s a Boca shirt. Thank god. He wants to swap it, because mine is the “original” one. Marcos jumps into the conversation and explains the shirt is his. The funny face guy resumes smashing on the wall with his hands. What’s next? Across the table sits Jildou. She is talking to some other dude. He’s a little clingy. Both are laughing, which is good I suppose. Next to Jil sits Ceci, Marcos’ girlfriend. She doesn’t look entirely at ease. Just behind her back rests an arm on the chair. My eyes trace said arm back to another guy, a guy with very red eyes. He has a funny smirk on his face, while eating pizza. He’s touching Ceci at times, which is why she moves a little forward on her chair every minute. Meanwhile people continuously sing and wildly move their arms in the air. Not a single second remains quiet. A guy grabs my arm and moves it around in the air. I guess I have to make this kind of move all the time. Lets join in! The shirt swap guy is constantly talking to Marcos, who appears to become a little nervous. Suddenly a man with a pirate beard approaches me. I explain we’re not from England while repeating in my head not to mention the Falklands. He seems surprised by the fact that we’re from Holanda, and mentions our queen, Máxima. I immediately embrace this conversational topic by talking about her recent skiing trip in Bariloche, Argentina. Not sure if I got my point across, but at least he liked the way I pronounced her surname, Zorreguieta. Yes, those double r’s should be rolling, I know, I can’t. Meanwhile Marcos is still talking to his newly acquired amigo, and insistingly rejecting the appeal that I should be the one to give a round of beers to everyone inside this bar. He’s taking the bullet for me. I couldn’t really tell you if the match was any good or not. All I remember was a goal resulting from a penalty, in Boca’s favor. For a moment it felt like a bomb exploded. A constant wall of sound from men yelling and shouting the loudest they can. All that’s left for you to do is join in on the festivity, immerse, be one, one group, united, comrades. Which is what sport is supposed to do, I guess. But we just cannot. This isn’t safe. We left after the first half. Our deeply frightened couchsurfing hosts, long time residents of Buenos Aires, apologized sincerely for taking us there. We walk back to the bus stop, again with a feeling of being watched. Marcos and Ceci thought we were lucky to make it out of that place in one piece and with all our belongings. We didn't realise it was that dangerous, but then again we couldn't understand half of what was being said. Sometimes, ignorance is a bliss indeed. Although this experience was a rather heavy one for a first day in Buenos Aires, I wouldn't have want to miss it.